A home gym can be a worthwhile investment, helping you maintain a healthy lifestyle, and saving you money in the long-run, too. All you need is a small exercise nook or a spare room that can be stocked with gym equipment. Strapped for cash? Workouts at home needn’t cost a cent; just throw down an exercise mat at the foot of your bed and voila. 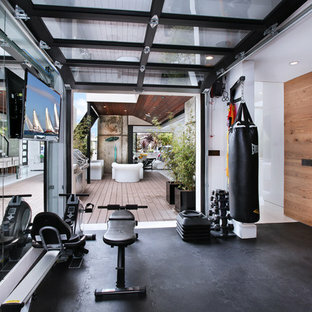 Home gym equipment can be large and bulky – a cross trainer, rowing machine or bench press, for example, will dominate most rooms. There are, however, alternative options for getting fit. Before you start planning the space, decide on what you actually enjoy doing, and what equipment you will get the most use out of. 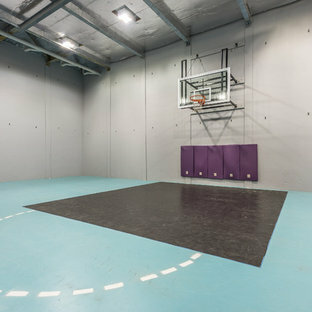 Depending on your budget and interests, you could have a yoga studio, meditation room, weights room, basketball court or even a dance studio. 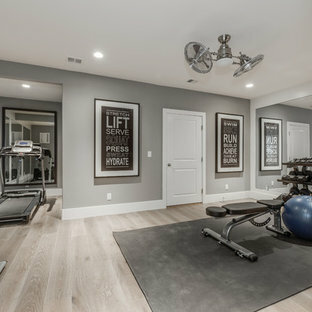 Browse the photos on Houzz for ideas and inspiration for home gyms, and save your favourites to an ideabook. 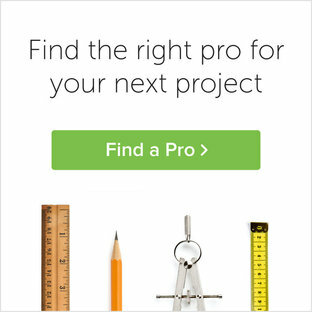 Once you're ready, you can find the architect or interior designer to help bring your vision to life. What kind of home gym should I have? 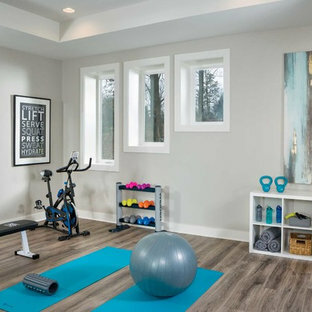 To get the most out of your home gym, plan a space that will allow you to incorporate many different fitness regimes. 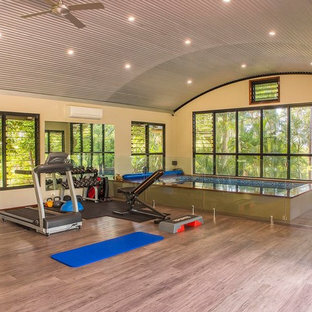 A spare room can be transformed into a hub for aerobics, yoga, pilates, kickboxing, dancing and cardio – just add timber floorboards or rubber flooring, a mirrored wall, an exercise machine, some dumbbells, a TV and a killer sound system. This way, there’s something for the whole family. If you have the space and enjoy doing specific workouts, consider making a specialty room like a yoga studio. How do I create a double-duty exercise room? Make the most of your home gym by making it a dual-purpose room. 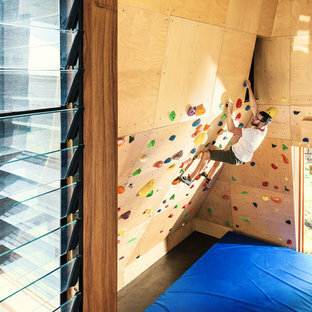 You could combine your gym with an office space, playroom, guest bedroom or garage, for example. Consider which space is most practical. A treadmill in your bedroom won’t be ideal if you workout at the crack of dawn while your partner is still sleeping; likewise, you won’t want to lift weights in a garage that turns into a sweatbox in the summer because it isn’t insulated. What kind of home gym equipment do I need? Again, this depends on what you enjoy doing most. Yoga mats, dumbbells and punching bags are popular purchases, or you could splurge on big-ticket items like a treadmill or multi-functional home gym system. Additional extras to help get you in the zone include a sound system, wall-mounted TV, as well as a mini bar to store cold drinks. Don’t forget to allow for efficient ventilation and cooling. Fantastic reno on Harborne Street with basketball court under the property! Hall Constructions NSW, Built Traditional/Contemporary style Home. Built in Wamberal, Central Coast NSW.